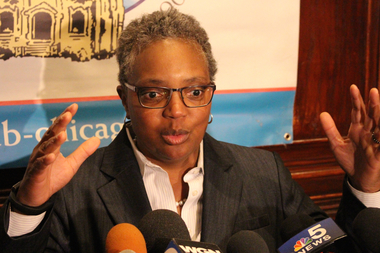 Mayor Emanuel chose Chicago Police Board President Lori Lightfoot to chair the Police Accountability Task Force. NEAR WEST SIDE — The Police Accountability Task Force convened last year by Mayor Rahm Emanuel will hold four public meetings around the city next month, according to a Wednesday announcement. In December, Emanuel charged the five-member body with drawing up a list of recommendations for reforms within the Chicago Police Department, to be handed to the mayor by March 31. Each open meeting will include a one-hour presentation by the group, followed by a two-hour public comment period, according to the announcement. • Tuesday, Feb. 2 at the JLM Life Center on the Near West Side, 2622 W. Jackson Blvd. • Thursday, Feb. 11 at the South Shore Cultural Center, 7059 S. South Shore Drive. • Tuesday, Feb. 23 at Benito Juarez Community Academy in Pilsen, 1450 W. Cermak Road. • Thursday, Feb. 25 at Sullivan High School in Rogers Park, 6631 N. Bosworth Ave.
Each meeting is scheduled to begin at 6 p.m., with registration opening at 5:30 p.m.